Authors love it when Book Clubs pick up their book for discussion. It's even better when feedback arrives - did readers enjoy the book? Feedback for me will come soon, because Brothers in Arms: The Great War Letters of Captain Nigel Boulton, R.A.M.C. 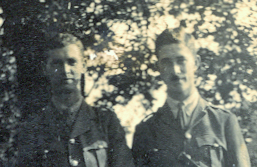 & Lieut Stephen Boulton, A.I.F. has been selected for reading by the Wednesday & Thursday Book Clubs at the prestigious Melbourne Athenaeum Library. The first group will discuss the book on Wednesday 5 April 2017. The second group will do so on Thursday 20 July 2017. The Boulton brothers’ letters were not written with the intention of telling a story but, when they are read in chronological order, a powerful underlying story emerges, painting a cultural portrait of the times, a first-hand experience of life during one of the most significant periods of the twentieth century. Is this what you expected this book to be? What did you find most surprising, intriguing or difficult to understand? How would you describe the themes in this book to others who have not read it? Many people are not at first attracted to the idea of reading a book of letters but many who have read this book say once they started it they ‘couldn’t put it down’. Was that your response, and why (or why not)? Did any specific passages strike you as memorable? The brothers were born in the Australian colonies of Queensland and Victoria of English parents. They attended primary school in New South Wales and, around the time of Australian Federation, they spent a few years at school in England, before completing their education in Sydney. What did you make of each brother’s concept of ‘home’ in this book? At what point do you think they became truly Australian? How else did the brothers change as the war progressed? One reviewer of this book headed her review ‘With heaps and heaps of love and kisses’. What did you make of the relationships in the book - between the brothers; between Nigel and Mona; between Stephen and Mona; between Dolly and her sons? What attitudes towards women surfaced in this book? Is this a war book for women? Does this book lack the voice of women? In their letters the brothers make occasional reference to ‘the enemy’, both in general terms and specifically (as Turks, Germans, etc), but is that concept personal for Nigel and Stephen? Erich Maria Remarque’s “All Quiet on the Western Front”, the classic novel about WW1 written in 1929 from the German point of view, describes in detail all the gruesome aspects of life ‘in the line’ for the infantry, especially the impact of the artillery. Remarque himself was called up for military service late in 1916, when he was eighteen, and served on the Western Front in 1917 until he was injured. Why do you think Stephen, serving in the Australian artillery, discloses so little of the day-to-day horrors of his war in his letters? Does that add to, or detract from, the book? How did you feel as you reached the end? Does the post-war story in this book sound familiar? The recipient Dora Boulton saved her sons’ war letters, had them typed in the 1920s and presented a copy of each typed set of letters to the new Australian War Memorial. Why do you think that museum requested and still holds both sets of the original letters? Why do you think Stephen’s were among the first sets of letters to be digitised by the Australian War Memorial. This is a non-fiction book, a set of historic documents in the form of letters … many letters were written in 1914 & 1915, less later on, and there are some gaps in the letter series. Did you notice this or wonder why, and did it matter to you? Did you find the letters repetitive? Would you have omitted any of them? Were the explanatory notes introducing some of the letters sufficient? Would you have handled this set of letters in a different way? What adjective would describe the stand-out feature of these letters for you? The two brothers wrote in an entirely different style but both were basically objective and occasionally ironic. Did you enjoy the language in their letters, so very different from the approach often used by later writers in books about WW1. The Past. Did you learn anything new about the history of WW1 or the role played by Australia from this book? Has it broadened your perspective on anything personal or societal? The Present. Do the issues described in the book affect lives today? The Future. The implications for the future raised by the book include, at the macro level, the problems of alliances dragging countries into a war they don’t want, and at the personal level, the consequences of a digital age. In one hundred years, will our great grandchildren have the same opportunities to know us, through our letters? Many books have been written about the Great War, examining the decisions of various generals and describing the exploits of the infantry in various battles. Can you think of any other war book like this one? At a time when so many new titles are being released to mark the centenary years of an appalling war, does this book have general applicability as a social and military history, beyond this particular family in this particular location? If these questions have intrigued you and whetted your appetite for this book, why not add this title to the reading list for your own Book Club? The book is as relevant to English readers interested in WW1 as it is to Australians and has been well-reviewed in England. 'Brothers in Arms' is available online through BookPOD in Australia (where the customer feedback for this book is excellent) and through the usual international online outlets.